The taste of fugu, they say – I have never tried it – is bland and slightly bitter. Just enough poison is left in the fish, usually from the milder fin, to give a buzzy numbing sensation to the lips and parts of the mouth. The true taste, of course, is the hit of awe at risking your life for a few squishy mouthfuls. When I was a young man I worked as a sushi chef in Osaka, in the old quarter near to where the epicentre of the 1923 earthquake struck. A few of the buildings still retained their characteristic carvings and low wooden walls but most were rebuilt after the earthquake in Japan’s answer to Art Deco: stone, wood and glass, with coloured ribbons and banners outside printed in fat lettering. The restaurant where I worked was old style, with a rockery and yard at the back. By the front door the ribbon read, WaterFire – 3 Star. The three stars were to show we served fugu, which is puffer fish, or blowfish. Next to the banner hung a dried puffed up fugu with a white lantern inside. Its eerie glow lured diners inside nightly to our small dining room. At five or six tables and the long bar edged with cushioned stools we satisfied their need for this strange, deadly delicacy. It takes three years for a fugu chef to learn how to prepare fugu. Any restaurant that serves it must hold a special license. Which is not to say fugu is sold unlicensed, it is, and plenty of it, but not in our establishment. Our fugu chef, Mr Harada, was one of the best. He had even written two books: a history of raw fish in Japan, which went to three editions; and a how-to guide for arranging outdoor banquets. Both sat in a display at Reception. Once, he prepared fugu for the Kabuki master Mitsugoro Bando whom the government had just listed a “living national treasure”. By Mr Harada’s account, he was a formidable gourmet too and very funny. He insisted on coming into the kitchen after dinner and bowing with the chef and with the assistants. The assistants had never witnessed such exaggerated formality and could barely suppress their giggling. Bando-san died years later eating fugu at a private party that a “friend” was supervising in Kyoto. It was big news, in all the papers. Today I help carry his coffin. Certainly I never expected, as I pottered around the kitchen stirring the sauces and rolling sushi, that I would make fugu myself. It’s not that I am unambitious. My wife, God bless, used to twinkle her eyes whenever I wondered aloud what to do. ‘Do nothing, Michi. I don’t mind.’ Then she would laugh and twinkle some more. Easy for her to say. Her garden beckoned and yielded up its harvest with confederate ease. My professional life was her concern only to a point, beyond which I had my well-being, my self to obey. In truth, I had tried one or two career paths, and had even spent some adventuresome years in the Navy, criss-crossing the Pacific with vast routines and plenty of water and fish to contemplate. It was never the life for me. I am attached to solid land, somewhat ironic as I settled in a district known for its earthquakes. In the restaurant trade, or hospitality as it prefers to call itself, there is a mix of calm and haste. It is very busy when customers need serving, but there is all day to get ready. Our days were each full of life’s minutiae. Myriad details to attend upon in search of a perfect state, which was unattainable but constantly strived for. Little passed by my attention without making an impression. The larder jars, for instance, were mine to arrange as I pleased. I put them in order of height. Were any moved I could make remedy without thinking. I grew accustomed to the energetic ordering my eye demanded. I knew, of course, that what I could see was only a tiny fraction of the world I inhabited but I found it satisfying to be part of such a grand and flexible scheme. I believe we create our own fortune to a large extent even though much is outside of our power. Sometimes it seems to me we are designed with capability beyond our understanding. What a puzzle that is! But I was happy and assiduous in my circle and, I think, well regarded. Mr Harada’s eyesight is failing. There, so easy to say. Now my tongue can slide it out. But at the time he begged me not to utter a word. ‘I am still Harada,’ he cried, holding my lapel and almost jumping off the ground. I was taken aback, very much his junior. Then he quietened down and whispered, ‘I am still Harada.’ He tamped down my jacket as if to make amends for any impoliteness. But I paid no mind to this and looked into his face. It was bashful, determined, scared, and proud – so many feelings passing over like fast clouds. Did I care about the customers? Of course I did. What if he misjudged and left in too much poison? It couldn’t happen. I believed in him. I loved him. He could do it with his eyes closed. His fingers were so sensitive. I used to watch him levering away the bones, the veins, the viscera. Thirty different procedures, each with a name. Kokumoyo, doriuchi, henji… He would mutter them as the water swished around the basin carrying off minuscule bits of fish. Then there was the crack as he pulled off his thin gloves that sent silence through to the dining room. Those waiting for the fugu rolled their chopsticks nervously guessing who was next to be served. 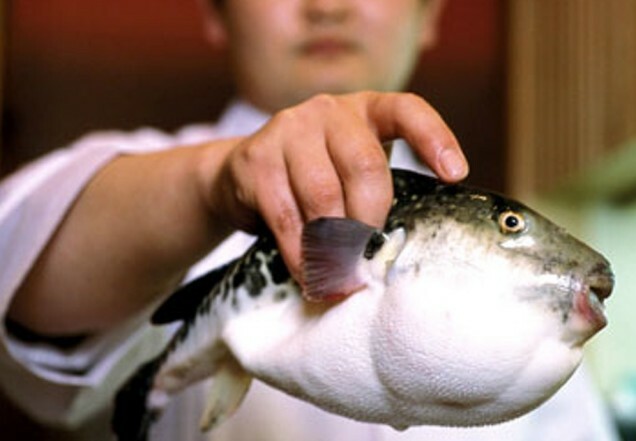 The other, non-fugu eating diners would blush sometimes as if ashamed at ignoring the macho call to arms. The older Japanese call it Russian roulette, but that is not really accurate since there is always a live bullet in the gun’s chamber in Russian roulette so the odds are monumentally stacked against you, whereas in fugu there is the chef to make it safe. Still, deaths are not uncommon. Around fifty people die from eating fugu every year, usually untrained enthusiasts trying it at home. Mr Harada was a generous source of knowledge on fugu topics. ‘I am like a library,’ he once remarked. Then he looked at me as if to see if I believed him, which I did for I could see no reason not to, and I smiled and tilted my head, thinking of a question to ask him. ‘Quizzical fellow, or not,’ he laughed. He clapped a floury hand on my shoulder. I had thought of a question but I realised I did not wish to know the answer and yet it would not leave my head. I was caught in my silence. Since then I have wondered what his reply would have been and if it would have made any difference. I had wanted to ask, ‘What else will you do, when you retire from the kitchen?’ It was not an appropriate question exactly and I didn’t ask it. I imagined him painting landscapes in the fields around Osaka, a delicate secret for anyone to share. Later, Mr Harada asked me to help him prepare the fugu, but I refused. It was Sunday afternoon, a quiet time of the week in the neighbourhood. I suppose he felt sure no-one would overhear us talk. I shook my head very firmly. He looked sad, and he combed his hair several times with his hands, aligning his parting. Then he touched my chest very gently with his finger to ask for my utmost attention. And he begged me to help him. I shall not like to put down the words he used. But they entered into the middle of me and they were clear and very deep. So I agreed. I am a fool, I suppose, but a fool will run all day for honour. ‘It’s not so hard,’ he said, ‘just requires patience. And strong eye, of course.’ He laughed. Mr Fuyushima, who owned the restaurant, had made it plain he expected us all to work even harder now that winter had come and the season for fresh fugu was underway. Every kitchen anyway is a store of pressure. We should have stood up for ourselves. Hong, the assistant, was working twelve-hour days. But these are excuses. I helped Harada-san with the fugu and a customer nearly died. Perhaps I had grown complacent. After twenty or so fish I had lost some of the panic I first felt when cleaning away the poison. I don’t really know. I won’t forget that night though. It had rained all week with not many customers in. On the Friday three tables of two were booked, one of whom after much discussion between themselves and then with Mr Fuyushima, who was attending in the dining room, ordered fugu soup. As Mr Fuyushima recounted later, when the food arrived at the table the younger of the two men changed his mind and declined his serving. The other man, who was dressed in a sombre suit, silver hair parted down the middle above a criss-crossed weathered face, tried without luck to cajole his companion to join him, and then started eating alone. He suffered for his choice. Within five minutes of dipping his spoon gingerly into the bowl, there was commotion. In the kitchen we heard a hoarse cry followed by a shout from another voice. I jumped over to peer through the small window in the kitchen door. The man’s mouth was opened wide like a cat yawning. Everything seemed in slow motion. He reeled up out of his chair clutching at his neck, then spun around two or three times and slumped onto the floor, not moving, just staring out at us with scared eyes. Mr Fuyushima waved us away from the window and called the ambulance. The man was sped to hospital where fortunately he recovered; he had not ingested enough poison to kill him. Our insurance company found out though, somehow, and they quadrupled our premium, which for a fugu chef already is high. Mr Fuyushima took to shaking his head at the slightest disquiet.